It’s Tax Season in the US, and throughout the land there echoes amongst the hills and valleys of writers’ forums the wailing cries of horror, disbelief, and pain as writers who met some measure of success last year find out what it will cost them. The long answer is that you should be working to understand your tax burden and minimize it even before your book is finished. The time to start working on this year’s taxes is today, not next January or, worse, April. I’m going to delve into a number of tax-topics over the coming weeks, but, first, it’s important that I point out I’m not a tax professional. I must do that because there are laws about offering tax advice when you’re not that thing. So none of this is advice — it’s my understanding, and, in many cases, what I do and why. You should use it as a base for your own understanding, but then do your own research and make your own decisions — or hire a tax professional to offer advice. That said, in this post I plan to address why taxes surprise so many writers and why you should be thinking about potential taxes now rather than later. The US tax system is complex and convoluted. As of this writing, it’s over seventy-four thousand pages. If you could read War and Peace in a week, it would take you a year to read the US tax code. Most people’s interaction with “taxes” is solely the annual filing season — and because of withholding rules that ensure the government gets more than its cut from each paycheck, most people get a refund at the end of the year. For an example, let’s use an author who’s single, has no children, and has a pretty good day job earning upwards of $40,000 a year. We’ll call her Sally. Now let’s say that Sally doesn’t itemize deductions — she lives in an apartment and has no mortgage deduction, so she just takes the standard deduction and exemption the IRS allows. Her taxes are pretty simple every year — fill in the data from her W2 and calculate with the standard deduction and exemption. Let’s say that leaves her taxable income for the year at $37,650. If she followed the W4 withholding instructions, she probably gets a refund every year, even if it’s only a couple hundred dollars. Sally published a book last year, though, and it did pretty well. It earned a few hundred or maybe a thousand dollars every month — say $10,000. Or she got a traditional publishing deal and got a $10,000 advance. Times are good for Sally! But Sally’s like most people and lives paycheck-to-paycheck. That $10,000 advance went to pay off a couple credit cards, or the $1,000 every month helped her get by and provided a few luxuries. Either way, there’s really none of it left come April when Sally does her taxes. 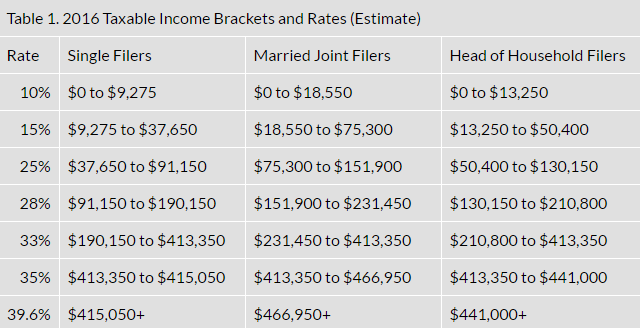 Sally’s day job taxable income of $37,650 puts her right at the top of the 15% tax bracket, which means that the next dollar she earns, and those after it, will be taxed at 25%. That’s all of her author dollars. 25% plus 12.4% for Social Security (FICA on your paycheck) and plus 2.9% for Medicare — 40.3% of Sally’s writing income needs to be paid in taxes. That’s $4,000! Even if Sally earned less from her day job and all her writing income fell into the the 15% tax bracket, that’s still 30.3% of every writing dollar that she’ll have to pay in taxes. Can you write a check in April for $3,000 or $4,000? Cue the annual wailing and gnashing of teeth by newly successful authors. Mitigating this, by either reducing your tax burden through deductions or preparing for it by paying estimated taxes is your job throughout the year. It’s part of the business of being an author, and I’m going to talk about both of these in upcoming posts. If you are already in this position for last year, then you should probably consult a tax professional now. If it’s early January, then you have a chance to avoid penalties for not making estimated tax payments last year if you get enough in by the deadline (usually mid-January). Finding a tax professional does not mean taking a bag full of receipts to the dude at Walmart this tax season … you’re running a business, which means you need someone who understands business taxes (preferably someone who understands the business of an author, as well). You can locate a tax professional through either National Association of Enrolled Agents or National Association of Tax Professionals. My next post will look into Estimated Taxes, which you should be paying throughout the year.